Ahead of John Key’s last day in ‘politics’, April 23 2017, it is evident that the National Laundry Spin Machine is in overdrive to smooth the former prime minister’s passage into the ‘post-politics’ private political system: Neo-Colonial Empire. Indeed, a spike in Key departure stories is detectable. However, Key’s departure may not go as smoothly as the Rich-Lister ‘Smiling Assassin’ and his fellow Rich-Lister friend and National Party President, Peter Goodfellow, had hoped. Journalist Nicky Hager is due to launch his latest book the night before Key officially resigns. It may explore New Zealand’s deep state with all its hideous structural alliances laid bare. The Key departure stories genre – so far – have let Key & Associates off-the-hook for exploiting a deceptive political strategy known as dirty attack politics. 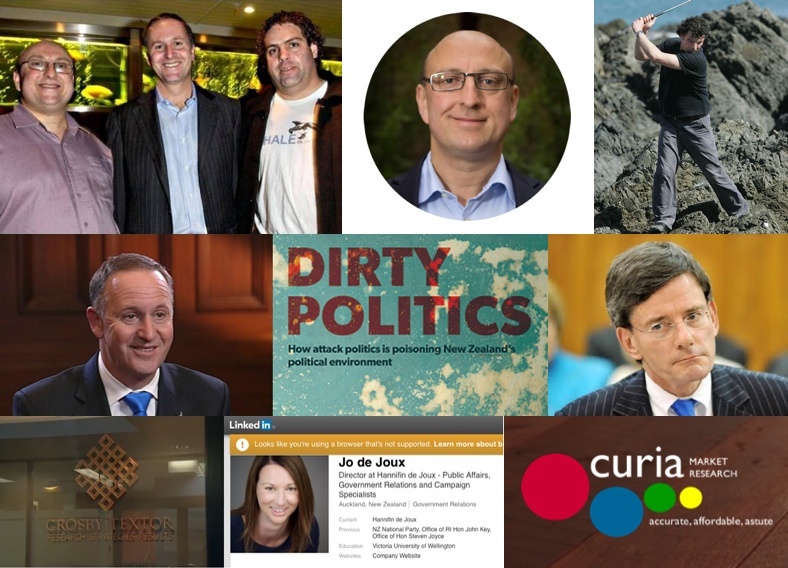 Those dirty political practices were revealed in journalist Nicky Hager’s book, Dirty Politics: How Attack Politics is Poisoning New Zealand’s Political Environment, which he launched on August 13 2014. The intent behind the imported political stratagem was that dirty attack politics benefit right wing parties such as the National Party, while it hurts left-wing ones more, because it is known to turn off left-wing citizens from voting first. Key admitted these facts in a pre-recorded interview on Campbell Live two days after re-winning power on 22 September 2014! Unfortunately, John Campbell failed to go for the jugular, and despite The Nation replaying this Campbell Live interview the following Saturday, the news media did not go for the jugular either. It was as if New Zealand’s news reporters, editors and producers wore kitten-mittens instead of Muhammad Ali boxing gloves. Indeed, throughout the scandal, no major news outlets led their lead stories spelling out the purpose of constructing dirty political attack environments, although I did on August 24 and October 5 2014 . This key omission meant that the dirty politics scandal had the effect of adding to the disenfranchisement of young people and left-wing voters from participating in the administrative franchise known as ‘democracy’. It also meant that most New Zealanders did not know that the dirty politics scandal was a deal-breaker situation. The key to the Key-led political conspiracy involved the use of a fraudulent two-track stratagem. The first track involved exploiting John Key’s charisma for charm offensives. Political strategists Crosby/Textor cast Key as ‘Mr Nice Guy’, a re-work of the archetypal Trickster character. The intent was that New Zealanders would not think for a moment that the minor scandals, embarrassing smears, and gaffs – that were blown out of proportion by a compliant propagandist news media system – had anything to do with Brand Key. Meanwhile, the second communication track involved Key’s top PR-man and senior advisor, Jason Ede outsourcing dirty political attacks to right-wing blog-sites, such as Cameron Slater’s Whale Oil and David Farrar’s Kiwiblog. 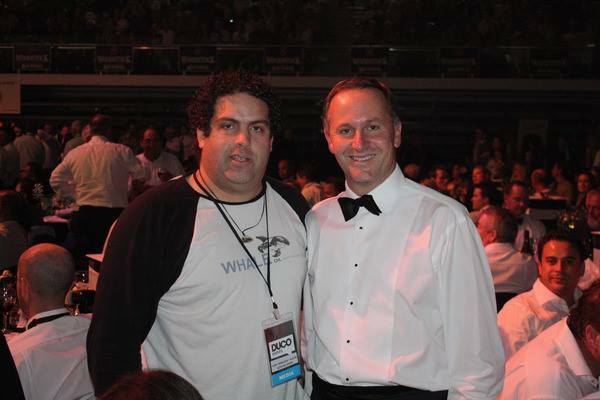 A Picture Tells a Thousand Blogs: Whale Oil blogger Cameron Slater and John Key on a happier night. Cameron Slater was scape-goated heavily in the media while the more vital political asset, David Farrar, largely escaped scrutiny. 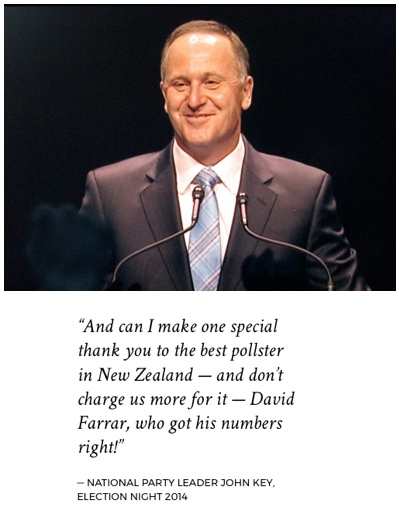 Farrar’s company, Curia Market Research, has conducted political polling for National since 2004, placing him in a pivotal position to write blogs to attack National’s opponents and assist in constructing deceptive political communications. 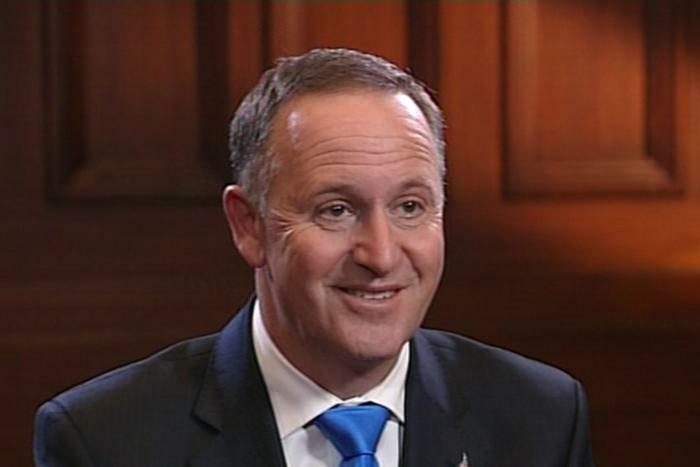 Mr ‘Nice Guy’ Key smugly brags on election night 2014. Brazenly, Key had maintained the fiction that Nicky Hager was a ‘left-wing conspiracy theorist’ for the last five weeks of the 2014 election campaign, yet bragged on election night that he had rung his outsourced pollster, David Farrar, night after night. Key’s use of dirty attack politics goes back to a contract signing between professional political manipulators Crosby/Textor and John Key in late 2006. There in Canberra, Key signed on the same political strategists that his predecessor, Don Brash, used to scape-goat Māori, beneficiaries and immigrants as a devious means to improve National Party’s polling. It is therefore crucial to keep in mind that attack wolves Crosby/Textor have a track record of devising such attacks against their clients’ so-called enemies. Exactly one year before the Trans-Pacific Partnership Treaty signing, boutique public affairs, government relations and campaign consultancy, Hannifin de Joux (HdJ), announced a strategic partnership with the New Zealand chapter of CrosbyITextor Group. Jo de Joux, of Hannifin de Joux (HdJ), had worked in various roles for the National Party since 1999, and has three non-genuine election victories under her campaign manager black belt, including the September 2014 general election amid the Dirty Politics scandal. Moreover, TV3’s The Nation, which replayed the Campbell Live John Key interview recorded on Monday September 22 2014, is listed on Curia Market Research’s website as a client. Good Time to Invest in Bail Bonds? [Pause] Not. I contend this fraudulent dirty political conspiracy – as exposed five weeks prior to the 2014 general election – was also a breach of section 240 of the Crimes Act. Key & Associates gained possession and control over privileges, economic and financial resources and caused loss through deception, by consciously undermining New Zealand’s democratic system for three consecutive election wins! Furthermore, Attorney General Chris Finlayson has left himself wide open to prosecution for furtherance of conspiracy for failing to make the then-Neo-Colonial Prime Minister – John Phillip Key – testify in an open session before the election – when it counted most! It is pertinent to recall that Tony Molloy QC said to business reporter Brian Fallow of the New Zealand Herald in 1999, “you can often prove criminal intent from people’s actions and the circumstances”. As Neal Katyal found in his scholarly law paper “Conspiracy Theory” published in The Yale Law Journal Neal, once a criminal group has been identified, the threshold of additional evidence that shows enjoinable conduct or a ‘meeting in the minds’ that is useable in court is lowered. Katyal argued that a “sunk cost trap” dynamic is created when people commit to a specific course of action that binds them and “escalates previous behaviour”. 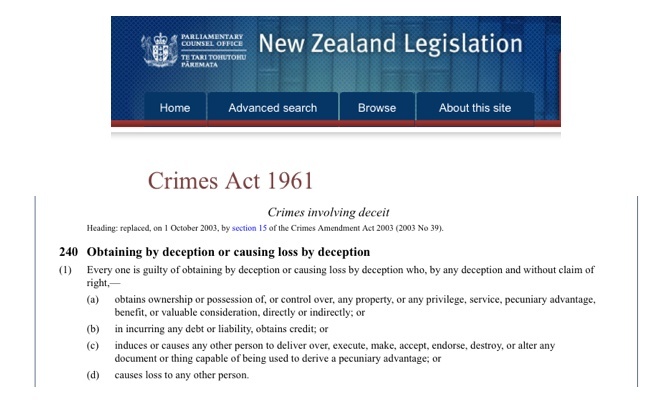 The failure of the Crown Law Office, the Electoral Commission, the Justice Department, the New Zealand Police, the Ombudsman’s Office and the Governor General to intervene and suspend the general election of 2014 belies a disturbing truth: dirty political practices are endemic to the New Zealand Government. The lack of serious, sustained investigations into the Key Ministry’s dirty political attack environment suggests that the prosecution authorities are content with a criminogenic political environment, which Monash University lecturer in international law, Eric Wilson, describes more generally as power crimes. In Newstalk ZB’s political reporter Felix Marwick’s account of his kitten-mitten 3-year ‘effort’ to gain Official Information Requests on the Key Ministry’s associations with right-wing bloggers, through ‘civil servants’ such as Chief of Staff of the Prime Minister’s Office, Wayne Eagleson, it is clear that a Kafka-esque culture of state censorship exists. That censorship held with the complicity of the media outlets, since New Zealand’s corporatized and cartelized media conglomerates act covertly as a machine arm of the state, as NBR journalist Nathan Smith stated. Furthermore, the roles of others in Key’s orbit also need to be investigated, such as his press secretaries, and Sarah Boyle, who Fairfax’s Stuff reported worked alongside Key’s ‘black ops’ man Jason Ede and was Key’s ‘OIA gate-keeper’ at the time of Dirty Politics scandal. I suggest the Neo-Colonial Government’s dirty attack politics practices, collusion and cover-ups will come back to bite them, severely. This may be a bad time for bail-bond investors. Brian Fallow. (27-28 February 1999). QC blames tax officials for fraud case failings. The Weekend Herald.